I use letter grades on a standard 4.0 scale. All students should check their School Loop grades on a regular basis. Parents should set up accounts on School Loop to keep track of what their children are doing. I do my best to update School Loop as frequently as I can. Student grades are based mostly on class projects: create an ad campaign in Photoshop, design a website, work with a team to make a video. Expect short writing assignments, and one big research/written project in the course of the year. But, for the most part, students are graded on the projects they produce. WHAT IF A STUDENT DOESN'T HAVE ARTISTIC TALENT? Effort counts. Caring about what you're doing counts. If you're having trouble or you're unsure, call me over to your computer and ask for feedback. If I give feedback ("it's too hard to read the letters where you've positioned them" or "use alignment to make this look better") go back to work and make those fixes. HOW TO GET A D: Let's say I give the class an assignment on Monday – use Photoshop to make five posters promoting Galileo's Five Goals. It's due on Friday. Let's say you goof around talking with friends, playing on the computer when the teacher isn't looking. You hand in your work early. When I open it I see you've only created three posters and each one is simply a picture slapped down with words positioned at random – no layer styles, no filters, no design effort. You had 4-1/2 hours to work on this project, but it looks like you devoted only 20 minutes. Congratulations! You've earned a D! In the more advanced classes students are asked to assess themselves and their teammates based on a rubric with five categories: Teamwork & Leadership, Responsibility & Effort, Communication, Problem Solving, and Creativity. I ask students to be honest in their assessments. Most often these self- and teammate-assessments alert me to problems. One boy got a very low rating from all his teammates. I switched teams and he got top scores from his new teammates. Assessments alert me to students who are not communicating, students who may need more mentoring on skills, and students who are not engaged in the class. They also alert me to students I need to watch and engage because they may not be pulling their weight. In most cases like this, teammate-assessments tell me things I've already observed during class time. 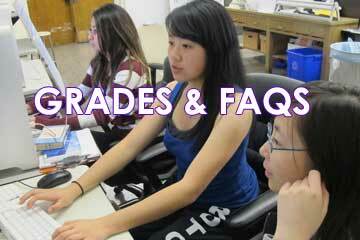 Media Arts seniors and juniors have the option to take certain media-related classes at CCSF. They will earn high school credits and college credits for the same class (concurrent enrollment). And the Career-Tech Ed Department will pay their tuition. Some students are kinesthetic learners. They may struggle with math tests and history papers, but they are good at making things with their hands. In another era, these students might have enjoyed building a birdhouse in shop class. I like to transfer that energy, drive and craftsmanship into building websites. Media Arts Pathway has some high achieving students. This past June two of our Media Arts graduates exceeded 4.4 GPA! But working beside these students are others who may not do so well in their core academic classes, but they get high grades in my classes (with portfolios to demonstrate the high quality of work they've produced). SO, WHICH STUDENTS SHOULDN'T TAKE MEDIA ARTS? Certain students need structure and do very well in a class where the teacher says, "Today you will solve the problems on page 121." But my classes call for student self-reliance and self-motivation. I may give the class an assignment on Monday that's due on Friday: design three different covers for a book you read in English class; or work with a team to make a video showing "implied action." That student has four-and-a-half hours of class time during that week and must determine how to use the time to achieve the goals. Will the student use that time effectively? Additionally, I encourage students to work together, help each other to learn and to make artistic choices. Mine is not a silent classroom with everyone stuck to their seats. I expect that some of my freshmen will goof around, waste time with classmates, and have difficulty completing the assignments in a satisfactory way. But LET'S BE HONEST here – when I see a senior who cannot focus and who cannot manage their time to complete tasks, I have to wonder what sort of job that young person can do after high school? Part of the curriculum in both Digital Communications and Point of View Video is helping students prepare a business-ready resume and a portfolio of their work. 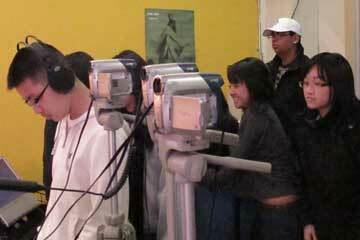 We are part of the Career-Tech Ed Department (CTE) in San Francisco Unified School District. This past summer six of my 11th grade students were placed in paid internships. Why did I only send six students? Some students had family travel plans that overlapped with the internship schedule. Some students had to attend summer school (if you don't pass your classes, you miss out on opportunities like this). But the other reason there were only six students is that I will only refer students I trust to summer internships or other opportunities. I will never refer students who are late to class, who take on responsibilities and then flake out, or who can't work on teams. If I let our students bring those behaviors into a business, SFUSD wouldn't get internships from that company in the future. Internships are limited to 11th graders. But there are other opportunities for students in other grades. During the year there are classes at Bay Area Video Coalition (BAVC) and BayCat. Recently, Academy of Art has offered scholarships for some high school students to take summer classes there. There are also classes and opportunities at Mission Arts Center, Vietnamese Youth Development Center, and more.